Explanation: Stars are forming in a dense molecular cloud a mere 1,000 light-years away in the constellation Serpens Cauda (The Serpent's Tail). 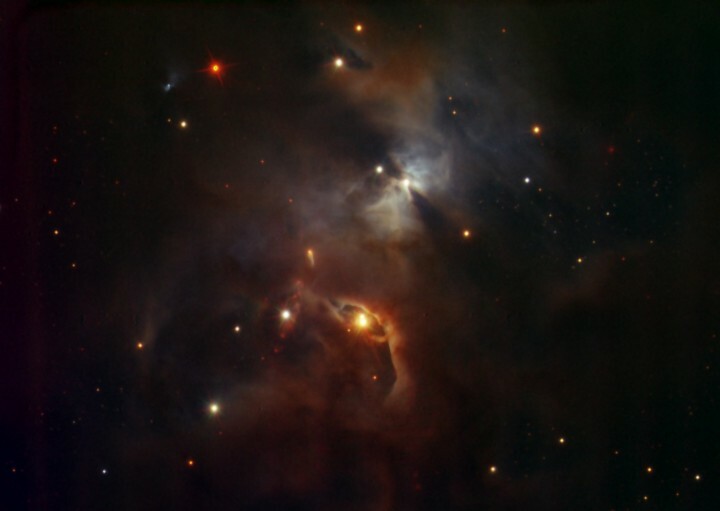 At that estimated distance, this sharp, near-infrared close-up of the active Serpens star-forming region spans about 2 arcminutes or just over half a light-year. Though such near-infrared observations can be made by mountain-top telescopes with specialized detectors, near-infrared light has too long a wavelength to be visible to the eye. This view was recorded with a sensitive camera, HAWK-I (High Acuity, Wide field K-band Imaging), just commissioned at the Paranal Observatory in Chile. Intended to illustrate HAWK-I's impressive capabilities, the tantalizing image highlights reddish young stars and protostars, likely up to a few million years old, emerging from the nebular gas and dust.